Oven Cooked Corn on the Cob – Perfect! For the 20+ years Michael and I have been together, we have been trying to figure out how to cook corn on the cob, so it comes out just right. Sometimes it has come out really good, but most times it hasn’t. It’s just a gamble. We have tried cooking it a few different ways; over the fire with wet husks, steamed, and boiled. The fire method corn came out amazing the first time, and not as much the second. The steamed method we only did once, because we didn’t like how it came out. More times than not, we have boiled it. 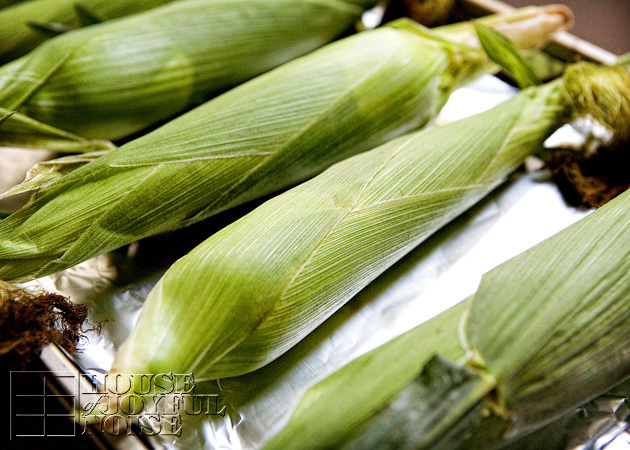 For us, perfectly cooked corn is- when the kernels are popping right off the cob as you eat it. But we usually don’t seem to cook it for just the right amount of minutes. Then we can’t figure out: Is it over-cooked? Or did we not cook it long enough? And that, is about how it has gone, for years. We get so excited to have corn on the cob, but that is because we only tend to remember the times it came out perfect and delicious. Finally, we have found the absolute easiest method to cook corn on the cob, perfectly. And that is, perfectly, every time. It’s crazy how easy and hassle free this is. 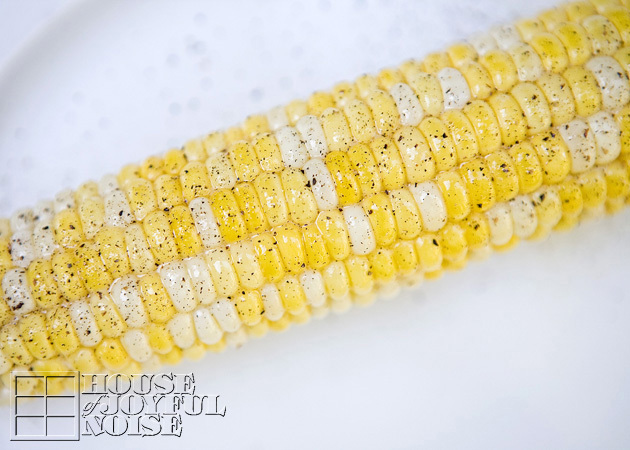 So at this time of year, when corn on the cob is such a popular summer side dish, we thought we should share with you the method that will be our one and only from now on. Both ways, the corn cooks wonderfully. I use method 1, because it is easier for me. I can put the whole pan with all of the corn in, and take it out, quickly and easily. Plus I can’t reach in the oven very far, and my hands burn easily. Michael prefers method 2, because he doesn’t want to get the pan out, or wash it, and he has longer arms. He throws the corn cobs, in and take them out one at a time when the timer goes off, just grabbing them without even using an oven mitt. Because he doesn’t want to get the mitt out either. Even though the corn is piping hot. He just doesn’t take precautionary safety measures, as a general rule of the fool. You know . . . . . . protective eye wear when cutting wood, a face mask when spraying toxic paint fumes, or using oven mitts to take hot things out of the oven, for gosh sakes! It been an argument between us for years. I remember his father was the exact same way, about all of the same safety measures, including taking hot things out of the oven mitt-less. His mother would squabble at the father about it too, after he’d say “Ow! !” Throw the thing down quick. (Chuckle.) “That thing is hot! !” Well HELLO!! What I don’t get, is why I thought my in-laws were so cute when they were bickering, and I get so aggravated at Michael about it, and I’m not feeling as cute. Honestly, I love my husband dearly, and I am thankful he is still alive, and well, in one piece. By the grace of God; this I know! Anyway, you choose the method that works best for you, and I’ll leave you alone about it. So put the corn in the oven however you choose to, and set the timer for 30 minutes. Oh how I love the smell of the corn cooking this way. A real roasted smell. After 30 minutes, remove the corn from the oven. 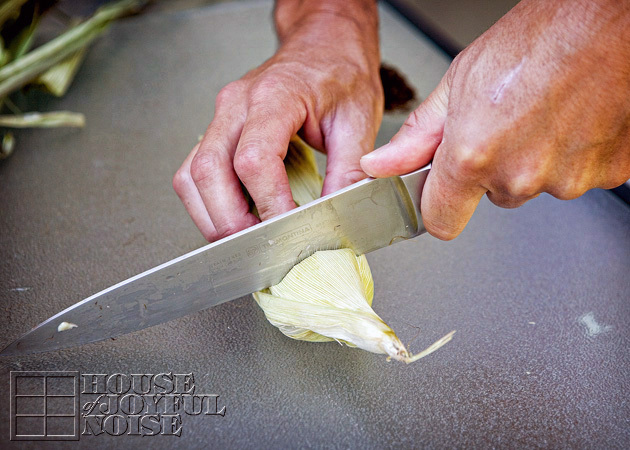 You simply take a big knife, and cut off the tip of the corn, unhusked, about an inch or so into the cob. This is where it just gets amazing to me . . . . . .
Then you just peel back and off the husks, which come off so easily. And, pretty much all of the silks come right off with it! Break off the other end, and season as you wish! We love it with butter and pepper. Sometimes a little salt. OH SO GOOD! So very easy, and perfect. 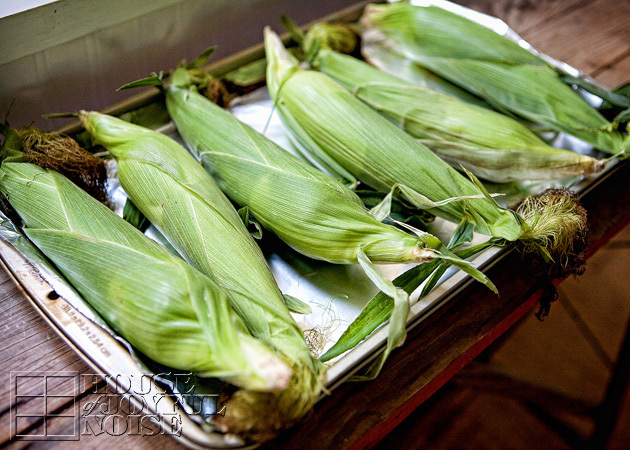 If you haven’t tried cooking corn in your oven, you must try it this way! 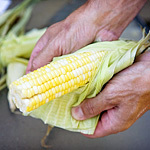 What is your usual way of cooking corn on the cob, so it comes out just right for you? And for how long do you cook it? We know there are many methods, and we’d love for you to tell us what has worked for you. P.S. As an update, if you want to make the husking even EASIER STILL, you can cut off both ends of the cooked corn (in other words, stem end included), and cob will just roll out of the husks and the silks practically fall off. But whether you chop both ends or just the tip, stripping the cobs after cooking them (in the oven) is much easier than shucking ahead of time! I finally tried this method tonight, and you were right! It came out perfectly cooked! So so SO easy! 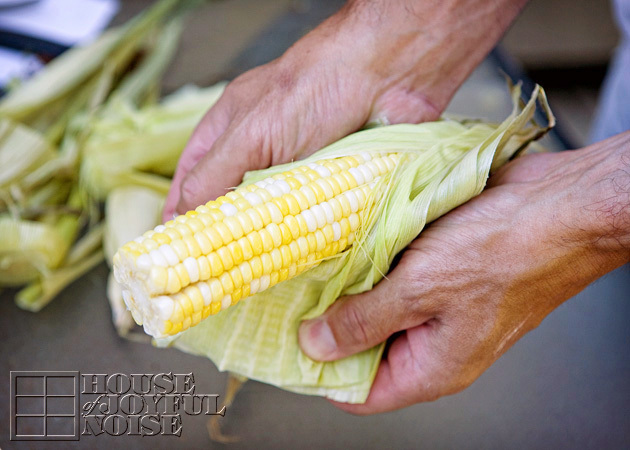 I would never trade the childhood memories I have of sitting in the backyard shucking ears of corn with my late mother, but man, would she ever have loved this method of cooking the corn in the husks. Thank you so much for sharing! 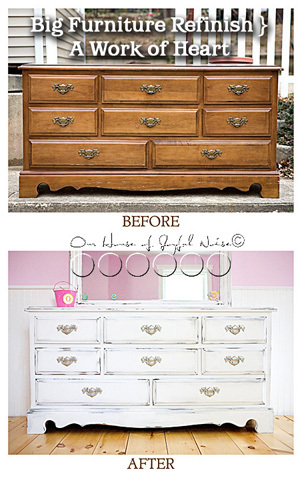 So glad you hear you tried this method, and found it to be PERFECT, too, Amy! We’re so glad you came back and let us know. I too have ample memories of shucking ears of corn in my childhood, but with my siblings. My mother wouldn’t have wanted to turn on the oven, if she didn’t have to. She hated the heat. But this method sure does simplify things, and it comes out so much better than boiled! Ooops, I meant corn..not corm. LOL! But I guess you knew that!! I will try this when I am cooking corn for a group. Sounds so easy and great that they are all done at the same time. Right now, I am by myself and I simply put the corn in the husk in the microwave for 4 minutes, then when done, cut off the stem end and with OVEN GLOVES, squeeze the corm from the top down and it comes right out of the husk without any silk. Tastes great also. Easy and quick for 1 and during the summer when the weather is warm, no need to heat the oven! Thanks Sheena, will try that. I usually end up with more butter on my plate than on the corn! I love the way the silks just slide right off when you cook the corn in the oven. I use OveGloves because I don’t like to say, “Ouch!” I discovered this method doing a Google search several years ago when I got tired of doing the whole charcoal thing outside. I usually cook mine for 35 minutes at 375. Maybe I’m over cooking it. For some reason, the pre-husked corn you buy at the store off season just doesn’t taste the same. I wrap it in foil, but it doesn’t have that fresh corn flavor you get with the husks. My family farms, so I’m spoiled when it comes to fresh vegetables. Nice ! I just throw mine in microwave for 3 minutes . Just pull silk off of top and leave in husk. That’s if you want a quick snack for 1 or 2 people . But for dinner your method is better because they’re all done at once. Tyler Florence said, Once you try this, you’ll never have corn on the cob any other way. The corn steams and cooks in it’s own husk without any pre-soaking or anything. I’m trying this tomorrow night for supper. I just came outside to husk a dozen & found this. I think I’m going to cut the bottom off and slide it out from the top. I’m wondering if there is any way to check for worms before cooking it? I meant cut the bottom and slide it from the top out the bottom. I’m hoping silk & all will simply come right off. Wish me luck!! Hey Stacey! Just getting your comment. SO….How did it go?? Did your corn on the cob come out perfect? After chopping off both ends, cobs unwrap right out of the husks for us, and all of the silk goes with it. So easy. 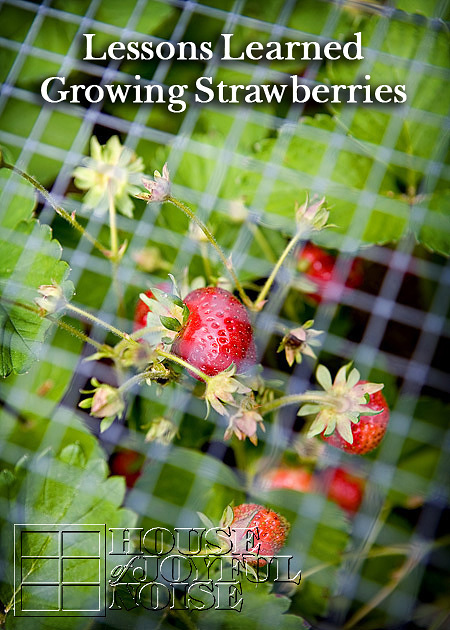 As for any worms, if there were any, would usually be near the tip, which we chop the top of off anyway. Let us know how it went for you! I do 375 degrees for about 15 minutes. After removing from the oven I pile them on the counter and cover with a towel and they will keep warm and steam a little more. You can then strip them and cut off the cob if you want to freeze them. Just put in a plastic bag. The farmer lady at the summer market told me about this a few years ago. Always excellent and no heavy hot pot to deal with. It does make sense that the gas grill would work too. Tastes like summer. Hi Michelle – Just getting to your comment. 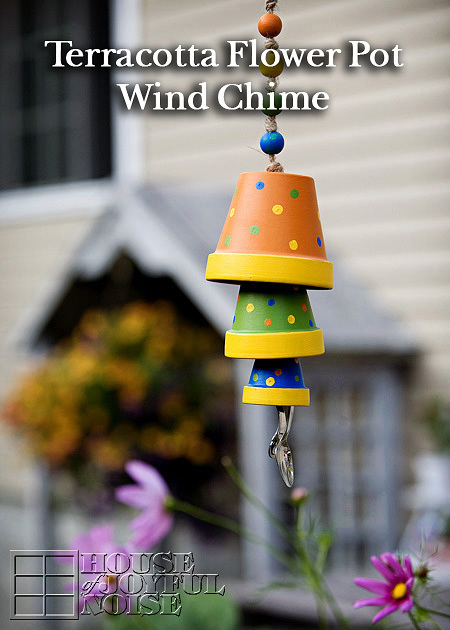 Thanks for sharing, and for the great tips. Interesting about being able to freeze them. I’ll have to keep that in mind. Maybe won’t have use for it until the kids all leave the nest, since they seem to eat everything in sight. 😉 LOL Glad I have your comment to remember this. I appreciate your thoughts you left with us here today. Hope you come again. We’re getting ready to plan on our Fall good-eats, next! I cut some off the cob to put in soups and stews. We have a huge freezer, so I have lots of fresh vegetables tucked in it just waiting for me to make something yummy. Enjoy your corn on the cob as it SHOULD be, from here on out! Much like everyone… my husband and I have the same discussion about corn, and have also tried many methods with hot-or-miss results. I am trying your method tonight and am hoping it’s as delicious as it looks. Plus, I can’t wait to find out if it’s as mess-free and you make it sound. Getting all that fine silk off is such a pain! I HAD to come back to tell you “THANK YOU”! Our corn tonight turned out great! It was so nice to be able to make everything in the kitchen (even though we LOVE the grill… it’s hard to get corn AND meat to fit together). And INDEED, there was MUCH less mess than trying to shuck it ahead of time, or from the top after it’s cooked. Peeling it from the stem end was the trick! I did end up turning the heat up to 400* after 15 mins… just because I wanted to make sure it was completely done. This worked out perfect for us! I will definitely be writing this down and following it from now on (although now I know where to find you in the event that I misplace it – or forget to get up and write it now). Thanks so much for sharing this! This was a huge success! Hi Erica! Well I was hoping you’d really come back and give us the corn-report! So glad you did, and it was all good news! Yes….the silks come off so very easily after the corn has been cooked. We never loved shucking corn to cook either, but really wanted the corn! In HOPES it would be just the way we love it. But it was a whole lot of work, for a gamble that didn’t always wok out very well. Enjoy the new method! You’re sure to have corn on the cob more often as we do, with it being so easy, and guaranteed it’ll be perfect. In the last 10 days we have made corn using your method 3 times, and taught some family members as well! We are definitely taking advantage of the “corn season”… can’t thank you enough! So, I took the corn out of the oven and waited a few minutes and proceeded to shuck it. At first it was awkward getting the hairs off and then I got it right. The corn was cooked perfectly but it wasn’t the best corn, so I cut it off the cobb, salted, peppered and added some lemon to it and ate it like that. I definitely will cook corn like this again. Hi Penny! – I love that you got back here to report how your corn came out, before I even responded to your first comment, which I thoroughly enjoyed! 🙂 I do hope you get some great corn ears to work with soon, so you can have the best possible corn on the cob! You seem to me like a super nice person, and I am guessing you really deserve at least that much! Please come around again, or follow us on Facebook to keep in touch! My mother used to put peeled corn in cold water and bring it to a boil and from that point start counting 12 minutes. That was fine when the corn was young and tender at the beginning of corn season. It was after a few weeks when the kernels got bigger, it was always a hit/miss event. Also, when we were many to feed as at a BBQ, looking for a pot big enough for all the corn was another issue. Everybody wants to eat at the same time etc. Well last week I was watching a TV food channel and this was one of the topic, putting the corn in the over in the husk. I decided to try it today so I just got on ‘search’ to find out how long to cook corn in the oven and came across your blog. You certainly fall into my category of cooks boggled by the almighty question: cooking corn for how long? Hi, Laura! I meant how long i was boiling it. Lol! Anyway, I had to roast it a little more than 30 minutes due to a mishap the boyfriend had with the oven (we were making a meatloaf at the same time. Lets just say its a good thing we didn’t burn the house down! Haha). The corn came out perfect, and everyone loved it!!! I think i will cook corn in the oven from now on! So easy and so good. Thanks, again! OH, Susie! LOL! Well it’s good to know if we lose track of time, our corn will still be perfect! Glad it worked out for you, and the house remains intact, despite boyfriends and meatloafs! 😉 Thanks so much for the report back! Please come again! Hi Susie. It was 30 minutes. How long did you end up doing and how did yours come out? Well let us be the first to say Michelle, that you SHOULD be sooo excited! 🙂 Let us know the results! ROFL- You had the kids and I cracking up, with your OH.EM. GEE., Laura K. My hubby helps a whole lot in the kitchen too. Aren’t we blessed girls? : ) I do cook, but he certainly makes many dinners too. I think corn on the cob made this way is something you and your husband can manage to make ‘just right together’. He can get it in the oven at just the right temp, and you can set the timer! ; ) That way it’ll come out perfect. Maybe HE’LL even decide he loves it. OK Julie, let’s see. Well when we did that similar method, with soaking the husks first too, it was over a small charcoal fire grill. First time great, second time so-so. BUT….I don’t believe we have tried that method on our big gas grill. Maybe we’ll try the big grill too then. I sure love the oven-cooked for sure. Seems to be very much the same to the oven, except outdoors, because the big grill closes. We have that EXACT same conversation whenever we make corn! I am totally trying this next time! So if you try it this way, I seriously want you to let me know what you think!